Intel was founded on July 18, 1968 with one specific goal: to make semiconductor memory practical and affordable. This was not a given at the time when silicon chip-based memory was at least 100 times more expensive than the magnetic core memory commonly used back then. Today, Intel is the largest manufacturer of semiconductor computer circuits in the world. Intel has been one of the most successful companies in the microprocessors business for the last two decades. We are here to talk about Intel’s two most popular processors in the value segment – Intel Pentium and Celeron. Although, Celeron is a less powerful version of the Pentium, both the processors deliver performance and value at budget-friendly prices. 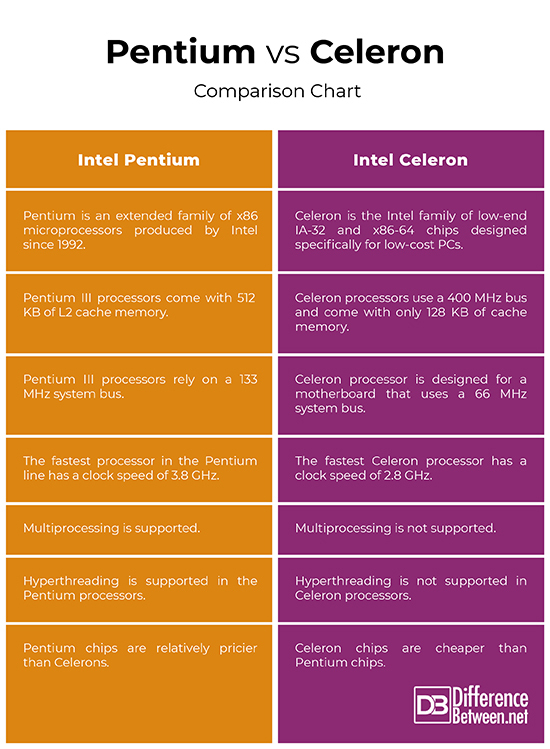 We look at the most important differences between the Intel Pentium and the Celeron chips. Intel Pentium is an extended family of x86 microprocessors produced by Intel since 1992. Intel introduced the first P5 family (586) processor, called the Pentium in 1993, which set new performance standards with up to five times the performance of the Intel 486 processor. In 1995, Intel introduced the Pentium Pro, the first processor to utilize the i686 architecture. With a massive 5.5 million transistors, Pentium Pro became the first to contain high-speed integrated Level 2 memory cache with its own bus. Since then, Intel has developed and released several P6 chips. Intel revised its P6 Pentium processor and introduced the more advanced and powerful Pentium II processor in May 1997. The Pentium II was a major upgrade over the Pentium Pro doubling the size of the L1 cache to 32KB. 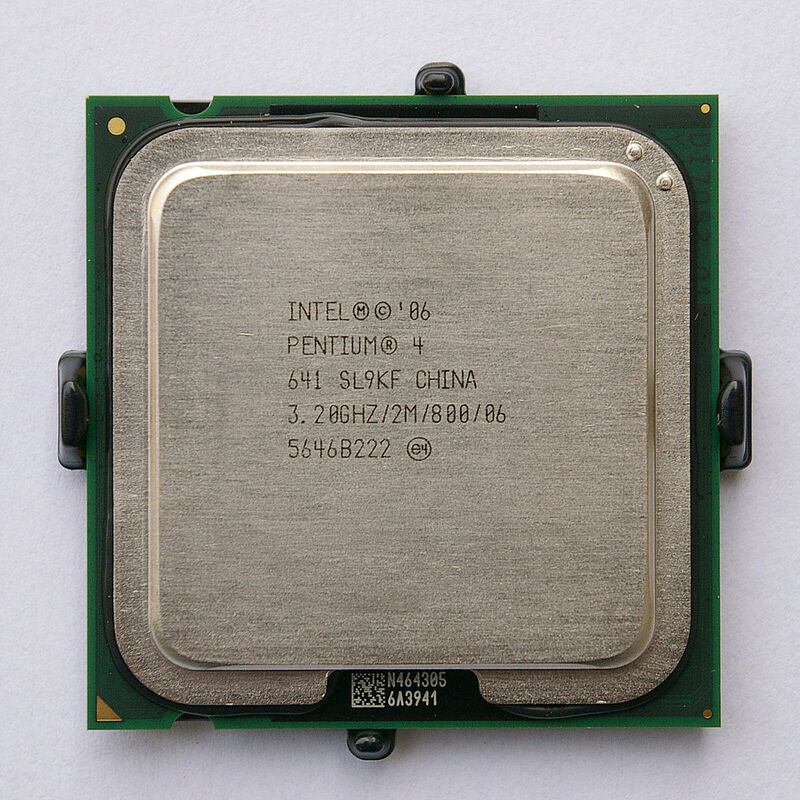 Intel introduced the powerful Pentium 4 chips in late 2000. Intel Celeron is a less powerful version of the Pentium processors designed for the value PC market segment. The majority of Celeron processors are based on Pentium II/Pentium III cores and run at speeds of 1.4 GHz or less. Celeron is the Intel family of low-end IA-32 and x86-64 chips designed specifically for low-cost personal computers. Compared to Pentium, Celeron chips have significantly lower performance with low cache memory. Originally based on the Pentium II architecture, Celerons have a low bus and smaller cache. Over time, Celeron processors have migrated to Pentium III and Pentium 4 architectures. Celeron chips are cheaper than Pentium processors. – The first Celeron-based CPU was based on the Pentium II architecture. The majority of the Celeron processors are based on Pentium II/Pentium III cores, however, the latest Celeron chips come in Pentium 4. Celeron is the second least powerful processor in the Intel family. Intel Pentium processors, on the other hand, are classic, low-cost chips for entry-level personal computers. Pentium 4 is the latest processor in the Intel Architecture 32-bit (IA-32) family. Pentium is still the longest serving family of processors produced by Intel, which stands above the Celeron family. – The Celeron is a less powerful version of the Pentium line of processors; however, the core is basically the same as the Pentium core. Other elements including the clock speed remain on the low side than the Pentium processors. Most of the Celeron chips are based on Pentium II/Pentium III cores and run at clock speeds of 1.4 GHz or less. The clock speeds range from 1.6 GHz to 2.4 GHz. The maximum CPU clock rate ranges from 266 MHz to 3.6 GHz. The fastest Celeron processor has a clock speed of 2.8 GHz, whereas the fastest processor in the Pentium line has a clock speed of 3.8 GHz. 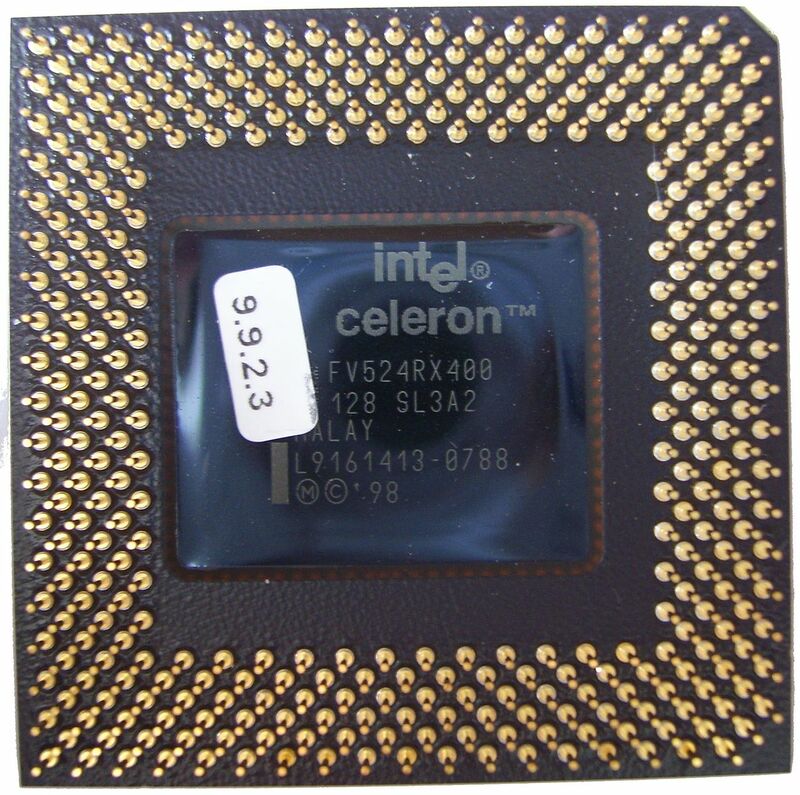 – The Celeron chips later than the 300 A include Level 1 and Level 2 cache on the microchip. Celeron chips have relatively less cache memory than Pentium 4 chips. Celeron processors use a 400 MHz bus and come with only 128 KB of cache memory, whereas processors based on Pentium 4 chips can have cache memory four times of that of Celeron chips. Pentium III processors come with 512 KB of L2 cache memory. However, the speeds can be closely comparable, considering L2 cache of Celerons is on the microchip which is not the case with Pentium II. This affects the overall performance of the computer. Although, Celeron is a less powerful version of the Pentium, both the processors deliver performance and value at budget-friendly prices. Celeron processors are a cheaper alternative to Pentium II, III, and Pentium 4 microprocessors, especially when you seek value over performance. The Celeron processors are based on the same core as their Pentium-based counterparts, but lack marginally on the performance side such as lesser Level 2 cache memory, clock speed, and performance. That being said, the fastest Celeron processor operates at a clock speed of 2.8 GHz, while the fastest Pentium processor has a clock speed of 3.8 GHz. Compared to Pentium chips, Celerons have a low bus and smaller cache. So, if you’re going to use your computer for light work such as web browsing or word processing, then you might go for Celeron processors, but then it’s not recommended for above-average use. Sagar Khillar. "Difference Between Pentium and Celeron." DifferenceBetween.net. April 1, 2019 < http://www.differencebetween.net/technology/difference-between-pentium-and-celeron-2/ >.